MGM Grand must pass two controlled demonstration tests before receiving its operation license. The exam will test the “integrity” of the slot machines and table games on the casino floor. The tests are scheduled for Thursday and Dec. 5. The casino is scheduled to open Dec. 8. 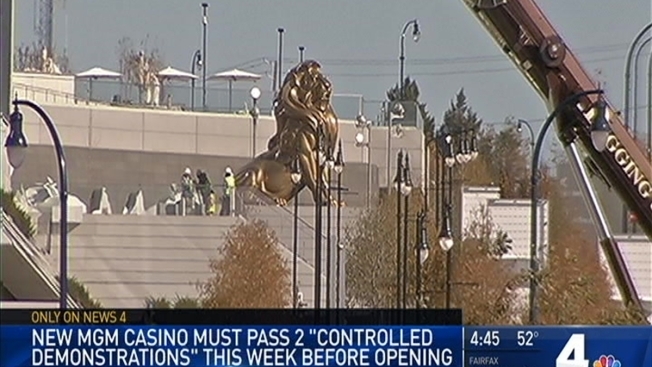 The billion-dollar MGM National Harbor casino must pass two “controlled demonstration” tests before it is permitted to open its doors Dec. 8. The first eight-hour test is scheduled for Thursday from noon until 8 p.m., according to records from the Maryland Lottery and Gaming Control Agency, which is conducting the test. Maryland gaming officials told News4 their exam will test the “integrity” of the slot machines and table games on the MGM National Harbor casino floor. The tests will ensure the games are accurate in their payouts and “compatible” with the state’s casino monitoring systems, gaming officials said. The second of two controlled demonstration tests is scheduled for Dec. 5 between 2 p.m. and 10 p.m., according to state records reviewed by News4. Successful completion of the controlled simulations are required before MGM National Harbor is permitted to open. “Approval of the license to commence gaming operations is contingent on the successful completion of both controlled demonstrations,” a memo from state gaming officials said. Similar tests were conducted on Maryland’s other five casinos. Those tests showed no “large-scale or systematic failures” but did reveal the procedural issues with staff training, a state gaming agency spokesman said. If problems occur during MGM National Harbor testing, the state “may require additional controlled demonostrations prior to issuing the operational license (to MGM),” the spokesman said. If MGM National Harbor successfully passes the controlled demonstration tests, the state expects to issue official operation licenses by Dec. 6.